The EGM had a diverse attendance with 41 participants (29 women and 12 men); representatives from GLTN Partners, grassroots organisations, National Statistical Offices, multi-lateral organisations and UN agencies. The participants came from over 20 countries in five continents. The timing of the EGM was of importance as it was organised to take advantage of the High Level Political Forum (HLPF) on Sustainable Development that took place in New York in the days immediately following the EGM. 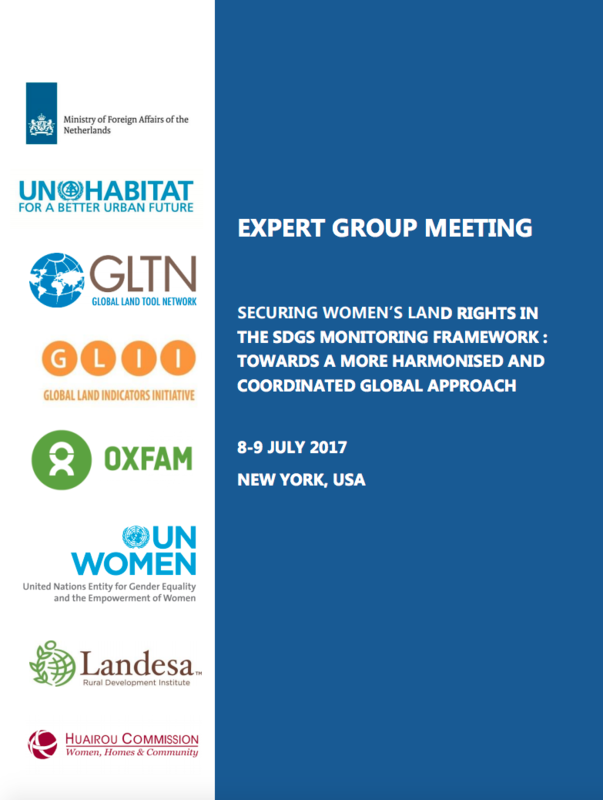 This provided an opportunity for participants at the EGM to attend and take forward women’s land rights recommendations in the HLPF. The HLPF was seen as an important moment and policy influencing space to discuss progress made on land tenure security related indicators (1.4.2, 5.a.1 and 5.a.2) and their progression movements from Tier III to Tier II and later Tier I during the IAEG on Sustainable Development due to take place in October [now postponed to November] 2017. This report captures proceedings from this meeting including presentations, discussions on various issues related to women’s land rights and the SDG indicators monitoring process. This report further highlights key issues of concern for the effective monitoring of secure tenure rights from a women’s land rights perspectives, provides recommendations to custodian agencies working on these indicators and suggests approaches to enhanced coordination and harmonization of approaches for effective implementation and monitoring. A summary of key messages from the EGM can be found in the communique from the meeting Annex 2 and a video with observations from the participants in this EGM is available at this link. The Global Land Indicators Initiative is a collaborative and inclusive process for the development of the Global Land Indicators started by the Millennium Challenge Corporation (MCC), UN-Habitat and the World Bank (WB), facilitated by GLTN. This initiative has now grown to include over 30 institutions around the world ranging from UN Agencies, Inter-governmental Organizations, International Nongovernmental Organizations, Farmer Organizations and the Academia. The Huairou Commission develops strategic partnerships and linkages among grassroots women’s organizations, advancing their capacity to collectively influence political spaces on behalf of their communities and enhance their sustainable, resilient community development practices. The Huairou Commission is a global membership and partnership coalition that empowers grassroots women's organizations to enhance their community development practice and to exercise collective political power at the global level.